→Chaga vs Reishi: What Is the Difference? 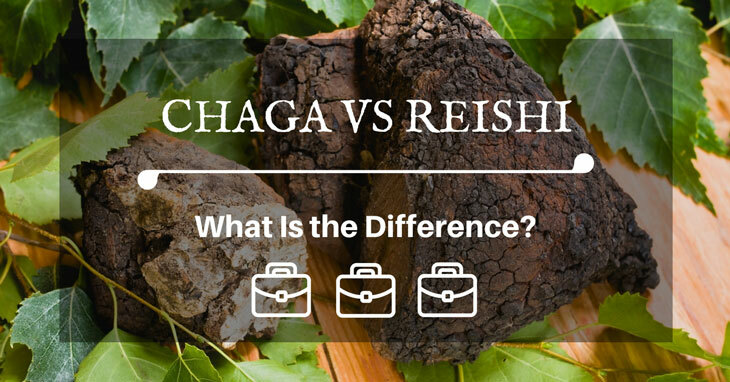 Chaga vs Reishi, do you know their differences? In the world of fungi, these two are popularly known as the king and prince of mushrooms. They offer many health benefits that could possibly help alleviate or prevent certain illnesses. 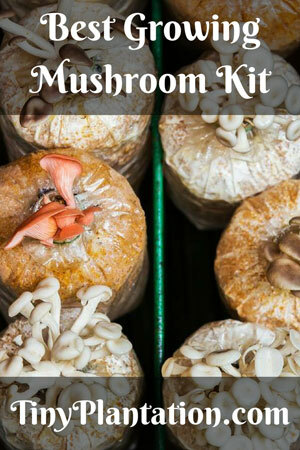 In this article, we are going to compare these two mushrooms based on their features and benefits. According to the Siberian shammans, Chaga is considered as the king of the mushrooms as this variety is very rich in betulinic acid. This substance is one of the most important antioxidants. Chaga grows mainly on birch trees in Siberia, Canada and Russia. You’ll see them as dark black spots on the trees and look like burnt wood. They can grow as big as a human head. They typically develop a symbiotic relationship with a birch tree and ultimately become part of the tree and its root system. It takes years for Chaga to show itself after growing inside the tree, a phenomenon which is rare in mushrooms. Because of its unique growing medium, Chaga develops a phenomenal maple texture and vanilla texture. Aside from that, this mushroom also contains anti-retroviral and anti-oxidant properties. It has been known that Tsar Vladimir Monomakh, the ruler of Russia in the 12th century, used Chaga to cure his lip cancer. During the past two World Wars, Chaga mushrooms gained popularity as a coffee replacement because of the energy-boosting effect and good taste. 1. Chaga extract reduces the growth of liver and colon cancer cells, thereby reducing cancer progression. 2. Reduces oxidative stress. In one study, Chaga is found to reduce the DNA damage of hydrogen peroxide by more than 40%. 3. Chaga increases the immune-cell production, increasing the ability of the body to fight pathogens. 5. Helps people suffering from diabetes. In an animal study, Chaga reduces the symptoms of diabetes by significantly decreasing the blood glucose levels. 7. Protects the body against dangerous blood clotting. 8. Promotes learning and memory, helping the body with cognitive functions. 9. Helps the body achieve a balanced immune system. 10. Works as a pain reliever. 11. Reduces the severity of allergies. 12. Helps heal wounds faster. 13. Chaga also promotes healthy eye, skin and lungs. One of the easiest ways to prepare Chaga is to turn it into tea. To do this, you need to boil 1 liter of water and then add a handful of chopped Chaga. Let it simmer for 20 minutes. Drain and let it cool before drinking. For better taste, you could add flavoring such as ginger root or cinnamon stick while the water simmers. In Chinese, Reishi is known as Ling zhi which means “spirit plant.” In the wild, Reishi grows in old or dead hard wood trees such as plum and oaks. Reishi is also a unique mushroom because it dies and yet grows back every year. It establishes its mycelium inside the dead tree and every year, they rot and die and grows again the next year. Unlike Chaga which basically grows in the wild, many people now started to grow Reishi for personal consumption or for business. Reishi is a mushroom that has a tough and woody texture and bitter taste. That is why they have limited uses in cooking and are mainly used as a tea or medicine. According to an article on Dr. Axe, Reishi has been used for thousands of years as a superfood because of its healing abilities. Aside from its medicinal benefits, in Chinese, Reishi is also tied to well-being, divine power, success and longevity. Reishi contains about 400 bioactive compounds with antioxidant, anti-fungal, anti-aging, anti-inflammatory and anti-viral properties. 2. Improves the condition of patients suffering from depression and anxiety. 3. Enhances immune system function. 5. Helps improve the condition of patients with heart issues and diabetes by regulating blood sugar levels. 6. Suppresses cell migration and cell adhesion of invasive prostate ad breast cancer cells. 7. Helps people with sleeping problems. 8. Helps heal kidney and liver diseases. 9. Enhances memory and brain function. 10. Is an effective energy booster. The steps in preparing Reishi mushroom as a tea is similar to that of Chaga. You need to first bring a liter of water to a boil. Add about a tablespoon of Reishi pieces and let it simmer for 2 hours. Remove from heat, drain and let it cool. Reishi has a very strong bitter taste so you may want to add honey or fresh ginger to enhance the flavor. Regardless of which one is considered “the king” or “the prince” of mushrooms, it is undeniable that both types of mushrooms promote better health. They may have their differences in terms of source, taste and texture, but overall, they are two types of mushrooms that you should include in your daily routine if you want to have a healthy body. It is important to note though that if you have a pre-existing medical condition, it is recommended to consult your doctor first before taking any of these powerful mushrooms. So which one would you prefer? Comparing Chaga vs Reishi, I would say that they both possess unique abilities to heal and help the body avoid certain diseases. If you have any thoughts about these mushrooms, please feel free to share your comment. Also, don’t forget to share this article with your friends.